Style: Multi-Level "High-Rise (4 floors or higher)"
Garage: "Garage: 1 Car Attached, Underground Parking; Parking Space(s): 1"
Lot Size: 2.51acres n/a "Waterfront"
Best view in Prince Albert, looking over the North Saskatchewan River, this spacious condo has an Urban feel with a country riverside view. Featuring open concept space, large windows facing East for morning sun. Maple kitchen with lots of cabinetry and large 2 tired island centre stage for entertaining, built in office/computer nook, natural gas fireplace, large dining room area. Glass door to large private balcony overlooking trees and river. Beautiful dark high end Laminate flooring throughout, big master bedroom has walk in closet, 4 pc ensuite and large windows. Main 4 pc bathroom has stylish open shelving for towel display. 2 Glass doors entering into den makes for an extra office or hideabed space for guest sleep overs! Huge entrance with spot lighted shelf for special display, and lots of closet space for outdoor wear, tucked away laundry/utility room off entrance area and kitchen. All stainless steel appliances are included. Building has elevator service and condo comes with heated underground parking stall w/storage. River's Edge is a secure complex with intercom, an exercise room and common lounge area for family gatherings, visitor parking and wheelchair accessible. Condo fees are $462.00 per month & includes natural gas costs & water. 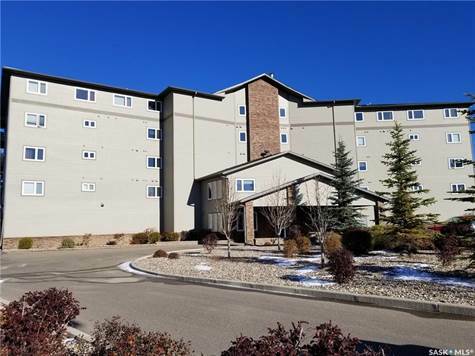 This condo is priced to sell...please call asap for a viewing!